Up early to get the day started. I have a lot of things to do today. I am headed out of here to go pick up Edward from a friends, then we are headed to work. He is working overtime while I am working on a school paper that is due today. Printed out all of the details that I needed for the paper and looked them over but now need to actually put it together. Going to the gym midday with Kevin and then back to finish up the paper. We have an event in the city today but not sure if I will be able to attend. I also need to organize all of the certificates for the Investitures tomorrow. Busy, busy, busy. I am so look forward to this class being over. This is my very last class so it will be nice to not have to worry about papers being due during June when B and I will be very busy. As usual it has been a busy week so far. Work has been good, busy but good. I just got my grade back from this last week. My efforts in Rhode Island really paid off. I got 100% of the points for the entire week which really helped bring my grade up from where it was. I had lost points because the papers were due on Saturday instead of Monday. This was my first week getting everything turned in on time and the paper was rather good if I do say so. So all of those points really helped. I have another paper due Saturday again and several discussion questions. Let's see if I can keep up the pace. Today I am off to the Hackensack Fire Department at 9am for a Fire Instructor training class. Should be fun. Finished working on my individual paper and got it posted. Have one Discussion Question to finish later. Right now we are all running around getting ready for the coronation tonight. The weather here is great. Nice sunny day outside and I was inside working on this paper all day. Hey, at least I got it done. I am home next weekend which will be nice. I have an event on Tuesday, Wednesday and Sunday next week. So it will be busy, but it should be easier to get my next week's paper done and some stuff done on my team project. Had a nice evening. The show was poorly attended but it went over well. Got some sleep later and now I am up working on some school work. Have a rehearsal for our command performance later today. Otherwise, just need to write a 4-5 page paper by the end of today. Really disliking this last class. The instructor has the papers due on Saturday instead of on Monday like all of my other classes did. If I ever decide to be an instructor for online classes, I will try to remember this. Also a poor way to end up my years at the University of Phoenix ONLINE with issues during my last class. On the upside, the instructor really knows his stuff and has been fair otherwise. His grading is fine, etc. Just the due dates are not normal. Finished packing for Rhode Island this weekend. I leave tomorrow. Picking up Jeffrey and Pepper in Manhattan tomorrow and then driving up. Should be a fun weekend but busy. I am trying to keep my head above water in school right now. Good thing I am home next weekend but still busy with our Investitures on Sunday and meetings in the city on Tuesday and Wednesday night. Never dull around here. The storm Sunday & Monday did not help much. We really got socked hard over at work. Teterboro is an old marsh so it flood fairly well. Not as bad as Patterson or Clifton where they have a river that spills out of it's banks on a regular basis. One friend at work has water about chest high in his 1st floor still. That is going to be a mess. It's supposed to be 70 this weekend so that will help things dry out. It has been just miserable all week here. Plenty more to do. Made it home. Actually swam home from the airport. They say it is the worst flooding here since 1882. It was a mess but I am home and safe. Now I am trying to get into work which is only 1/4 mile away. Hwy 17 was closed under I-80 and Route 46 so had to detour around that. Well my 4:25pm flight has now been moved to 6pm. The plane is here, but I can not get online to find out what else might be happening back home. Hopefully my flight will take off and get here. The brunch was nice. First time I can remember that they had a "plated" brunch instead of a buffet. But it was nice and good. Everyone appeared to have a good time. Now it is just a question of getting home. I am sitting with a friend of mine from Chicago who is flying out also. His flight is a few gates away from mine. So we are talking and keeping each other company. This airport is very antiquated. So there is no wireless here at all. So not sure when this will get uploaded. The weather here is wet and windy. Had a nice time at the Out of town show last night and got some much needed sleep. Not sure how things will turn out tomorrow with the weather back home being so bad. Will just have to wait and see how it turns out. Getting ready now for the Adornment here in Saint Louis. They are a Barony and not an Imperial Court so their coronations are called adornments. Made it safely to Saint Louis for their 2nd Adornment this weekend. My room is not ready yet, so I am at Starbucks just a few blocks away from the hotel. The arch is just a few blocks the other direction so I might go over there later. Right now I am lugging the computer, so do not want to do much exploring with it. Still need to eat something. That early morning breakfast back in Jersey is very distant now. It's cool here, just like in Jersey. What is really bothering me is the flight back. The weather forecast is for a strong Nor'easter on Sunday evening. Right when I am coming home. I'll be sure to carry my power cord for the computer in case I get stuck at the airport for several extra hours. Normally I pack it so that I do not have to carry the extra weight in the back. It is heavy enough as it is. Got some school work to do. Did lots of reading on the plane since I had printed out several chapters that I needed to read. We had a really nice time at the Easter Parade on 5th Avenue yesterday. It was very cold, but loads of fun. Gefil and I were on the Channel 4 news for a few seconds. Several people called me and told me of the bit part we had on the news. But best of all, Edward made the New York Times playing the part of our Easter Bunny. He was jumping around like a bunny rabbit with chocolate candy in his Easter basket for all of the little kids. He was having a great time and he got his picture in Monday's New York Times, Metro section, Page B3 today. There was an article about Jeffrey / Gefil on March 30th, then 11 pictures from Night of a Thousand Gowns were in Sunday's Style section. This marks the third time in one week that we have been in the New York Times. This weekend, I am off for the Saint Louis Adornment. I fly out Friday and will be back on Sunday. (above) Monday, April 9, 2007 New York Times picture, Metro page B3 - Photo by Patrick Andreade for the New York Times. Viscount Edward as our Easter Bunny. (below) Emperor XVI Craig Hollywood at Radio City Music Hall just before the parade. (above) Our Easter Bunny, Viscount Edward with Empress XIX Robin Kradles. (below) Members of the Imperial Court of New York at the annual NYC Easter Parade on 5th Avenue in front of St. Patrick's Cathedral. A unique NYC tradition going back decades. What a busy week this has been. I have restarted school and am currently in my last class. CMGT/578 - CIS Strategic Management is my last course that I have to take for my Masters degree. I have 6 weeks in it and from the syllabus, lots of work to do. I just got back from Queens where I went to pick up a bunny rabbit suit for Edward. 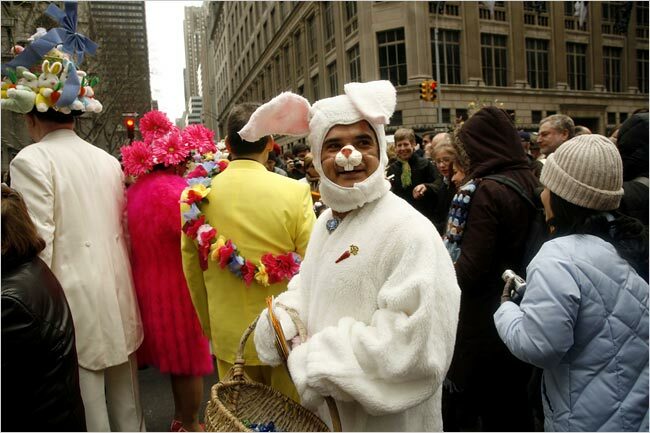 He is going to wear it at the annual 5th Avenue Easter Parade on Sunday. I'll be in a tux and my crown. Lots of fun walking up and down 5th avenue looking all regal. Thursday I was in Brooklyn for the Cherry Grove Fire Department election. This was a contested election (i.e. there were two of us running) and I lost, but I did very well in the ballots. Set myself up great for next time in 2009. We elect new assistant chiefs every 2 years. I have only been a member for 3 years so I knew it would be a stretch. But now many more people know me and will be watching me. If I show them that I am serious and have the best intentions of the department and community at heart, then I should be a shoe in next time. It was great getting to see several of my friends from the department. Looking forward to seeing them on the island this summer. New pictures posted which I know people will love. General membership meeting at the LGBT Community Center on 13th street between 7th Avenue and Greenwich in the village. It was a great meeting, our first after being elected. Lots of details to get ironed out and taken care of. But we think we have gotten off to a great start thanks to our dowagers and especially the president of the board. Kudos to both of them for all of their help. Made it home and everything is upstairs and into the apartment. Have to still unpack lots of stuff and the first load from last night was taken to Kevin's place about 3 blocks away. He is at the home opener of the Yankees right now and will be home later. So we will bring that bunch of stuff back then. I have errands to run and need to get the mail and have a dental appointment later today. Wow, they have the court front page changed already. Check out ICNY.ORG for our press picture and updated home page. You can also look on RINGO for more pictures from me. Just click on the RINGO here or from the web type in www.RINGO.com then under FIND A FRIEND type in craig@icny.org and click GO. It will take you to my home page on ringo. So enjoy the pictures. Just getting up and now going to finish packing and getting ourselves out of here and back to Jersey. Had a great weekend (I think). Some of it is still a blur but the pictures that a few friends have sent me and the ones on my camera helped. It has been a fun filled weekend that is for sure. But now time to get back to reality. I have a dental appointment at 3 today and have to be out of the hotel soon. One load went to Jersey yesterday via my friends Angel and Junior so that really helped. Had a great evening last night. The coronation went well and we got crowned in grand style. Right now we are trying to pull ourselves together and get ready for Victory Brunch. We will be leaving the room around 11am to head downstairs. We have two of our Beefeaters from last night escorting us down. The evening is still a bit of a blur and I was not even drinking much at all. Just sped by so fast it seems. Pictures soon.